Food insecurity is becoming more evident on college campuses, and UNO is no exception. A growing concern about food insecurity among our fellow Mavs has prompted action. 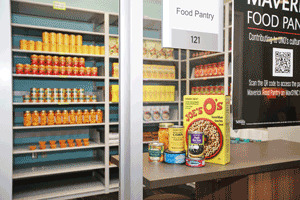 UNO’s Maverick Food Pantry aims to contribute to UNO’s culture of caring by providing resources to those in immediate need and connecting them with additional resources in the greater Omaha area for long-term support. The Maverick Food Pantry offers food and personal hygiene products to all members of the UNO community by providing healthy, organic, and culturally sensitive items. Requests for food packages can be submitted through an easy online form twice a week. To request a package from the Maverick Food Pantry fill out the Request Form here using your UNO Email. Individuals can complete a request form twice a week. The Maverick Food Pantry offers food packages containing approximately two days worth of non-perishable items. Trouble accessing the form? Click here. If you have questions about the Maverick Food Pantry, visit 130 Weitz CEC, email unomavfoodpantry@unomaha.edu, or call 402.554.4083. The program offers free rides on the Metro Bus System to current faculty, staff and students. Your MavCARD is your bus pass, and is active if you are a currently enrolled student or an active faculty or staff member. The MavRIDE passes can be used at any time on any Metro Bus. The Maverick Food Pantry is a resource available to all UNO students dealing with food insecurity.